These days, it's safe to say midcentury is the reigning decor influence. But when designer Katie Hackworth went about creating her dream home in Medina, Washington, her inspiration went farther back, to classical traditions in European architecture. While the brownstone is a completely new building (created with architect Holden Withington), it feels more old world, which fits in the picturesque Seattle suburb. "[The area] has a quiet and peaceful way about it, with quaint old-school touches like a corner grocery store and post office that date back to the early 1900s," Hackworth said. In the interior, Hackworth opted for consistency and balance — building on the classical framework Withington designed — with textures and patterns that feel traditional, but not rigid. "I wanted the structure to read timeless, but carry a modern thread throughout," Hackworth said. 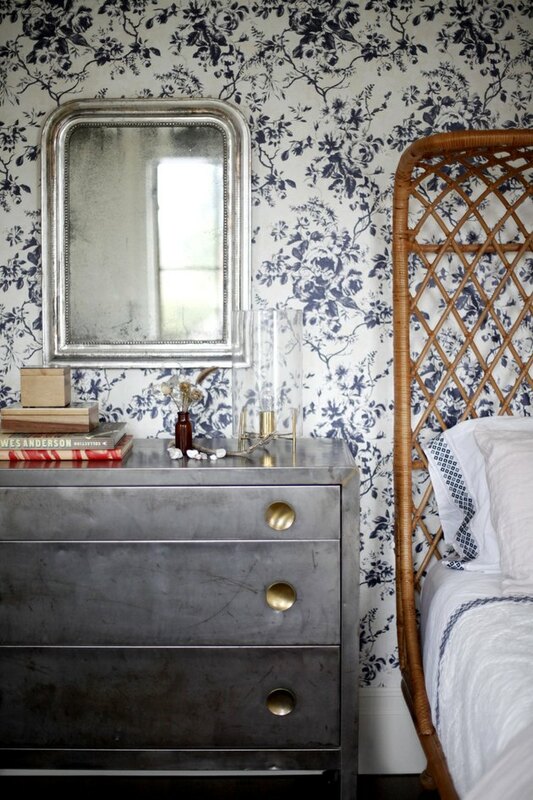 "I love the idea of combining new and old." 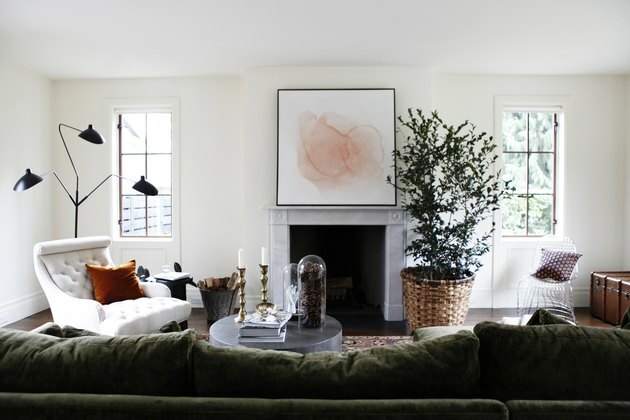 The living room is a play on texture: the softness of the green Cisco Brothers sofa, the charcoal metal of the Serge Mouille floor lamp, the wicker planter, and a concrete Jayson Home coffee table. In a different portion of the living room, Hackworth puts a slight spin on a traditional fireplace by choosing a pale blue material. 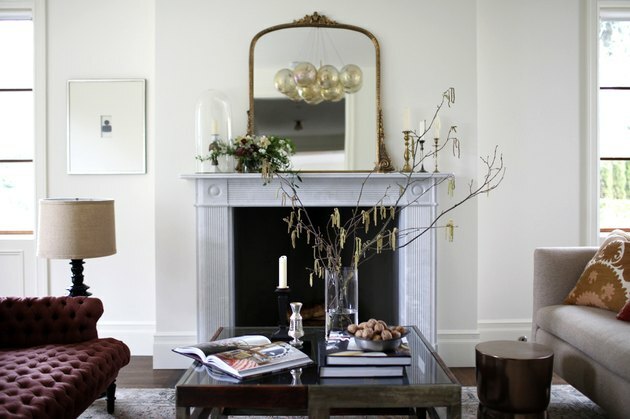 The antique gilded mirror almost feels Parisian. 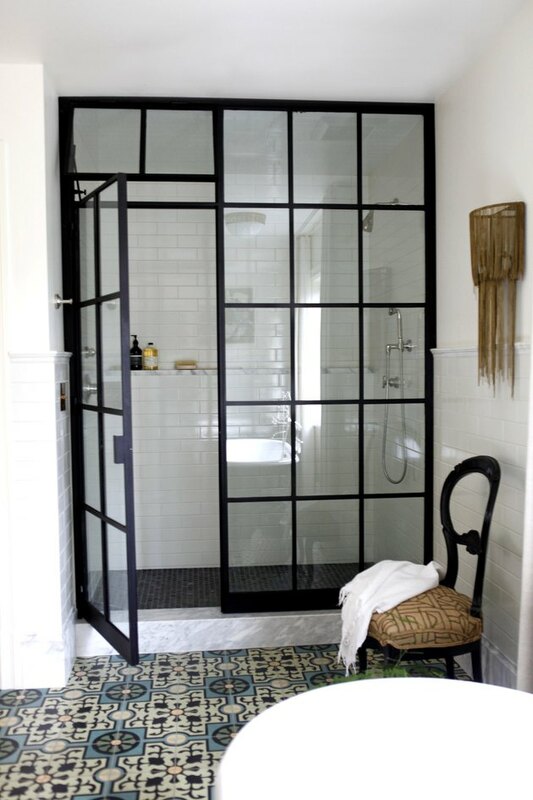 European design sensibilities are used throughout. 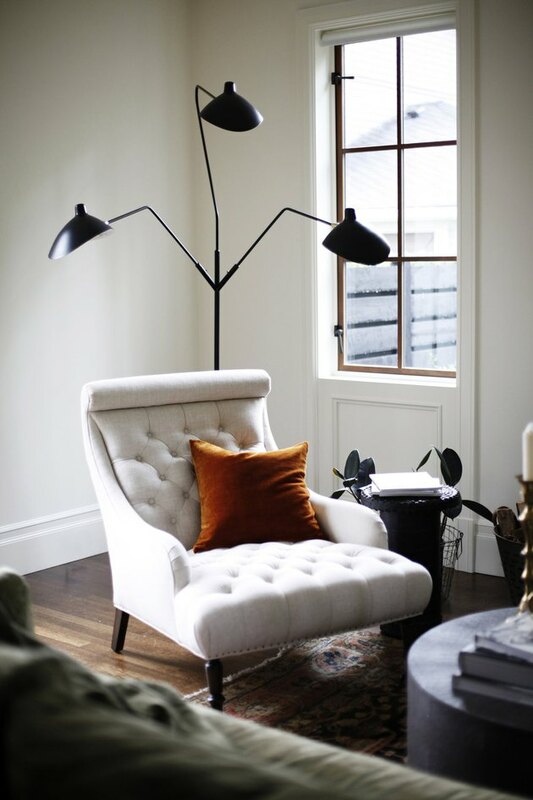 A white John Derian for Cisco Brothers chair stands out against dark stained white oak floors. 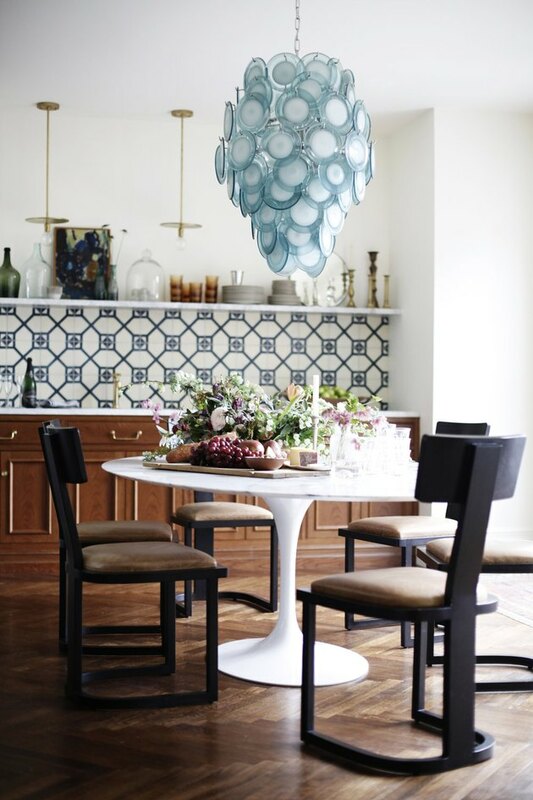 The dining room relies on contemporary furnishings to create a pleasing contrast, with solid oak chairs from Nickey Kehoe and a Saarinen dining table purchased from DWR. Custom cabinets keep darker, natural textures toward the bottom half of the room. Meanwhile, toward the ceiling, white walls reflect natural light. 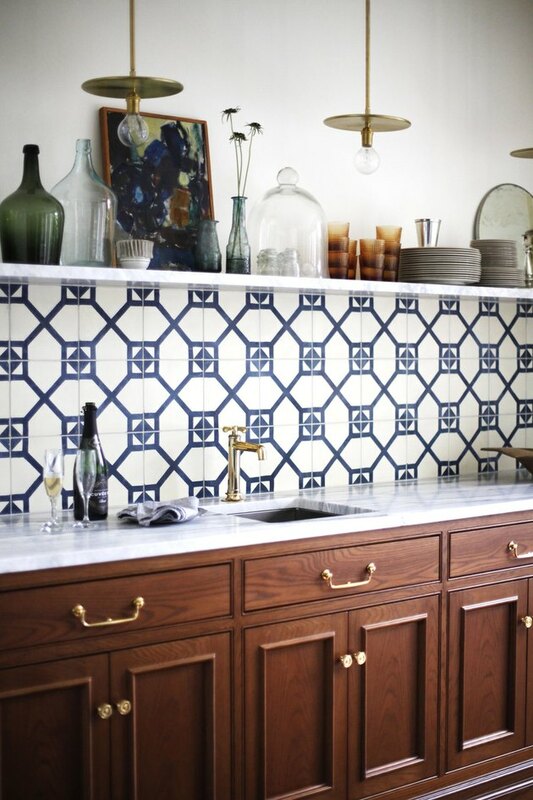 Mosaic House tiles make up the backsplash. In the kitchen, modern appliances mesh with vintage details. A sink from Blanco features a faucet from Waterworks, which matches the metallic saucer hanging lights by Workstead. Lively wallpaper from House of Hackney sets the stage for a bold bedroom design that mixes natural textures and whimsical shapes. 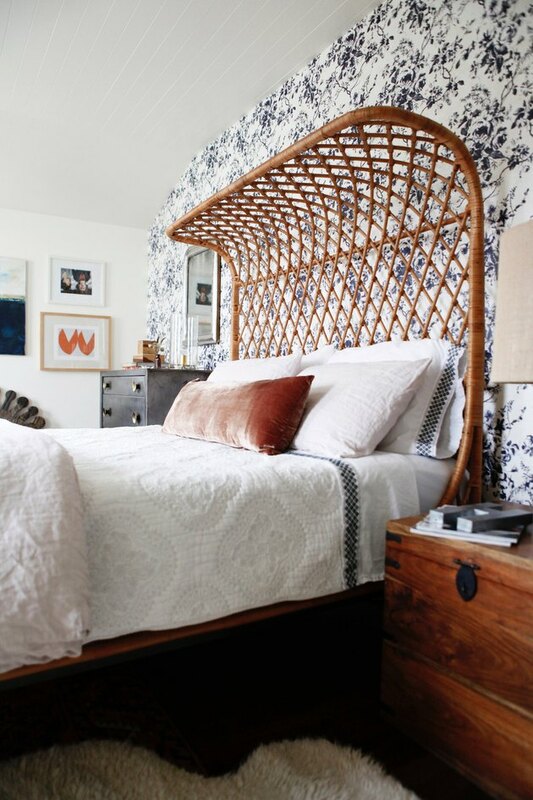 Hackworth picks up on a slight boho vibe in the bedroom, with a wicker bed from Anthropologie, a vintage dresser purchased from Rejuvenation, and layered bedding from Coyuchi. Being a designer on your own project has its benefits: "Overall, it was a pretty smooth process," Hackworth told us. 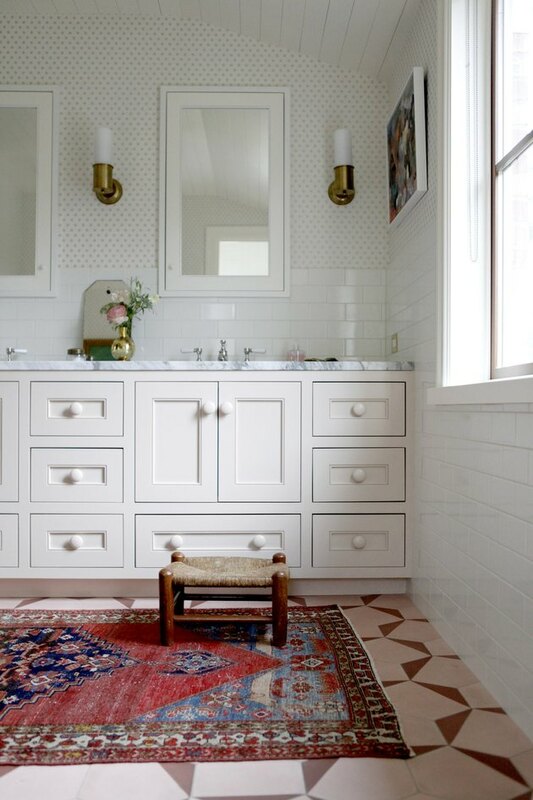 For the bathroom, Hackworth opted for a red, Persian-style rug to go over the Marrakech Design floor tiles. The cabinets were custom-designed and painted in Pinky Swear by Benjamin Moore. This Melbourne Home Was Once a Candy Factory!